Craft is characterized by tacit knowledge, which is featured as embodiment and contextualization. 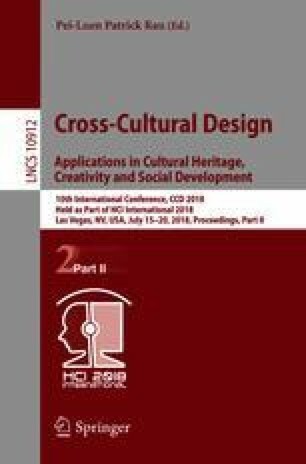 In the circumstances that the rural craft learning socio-cultural context have already changed significantly, this paper tries to probe the issue that how to capture those characteristics of craft knowledge and transfer them successfully into an attractive craft learning experience for rural children. Taking Huayao cross-stitch–an ethic minority Intangible Cultural Heritage in southwest rural China as a case study, the paper regards digital game as a mediated method to arouse the craft learning interest of rural children and facilitate their understanding of craft knowledge. Focusing the acquisition and presentation of craft “Know-How” knowledge in craft, aiming at promoting the learner’s reflective observations in learning experience, this paper proposes a game-based craft learning experience design model and verifies the model with a Huayao Cross-Stitch Game. The project is funded by the Department of Development Planning, Ministry of Education P.R.C, under project No. (2017)304; Qipai Intangible Cultural Heritage Protection and Research Fund, Academy of Arts & Design, Tsinghua University, under project No. (2015)05. We would like to thank Zhang Bo, Hu Yuzhe, Li Yongbin and their students in Baishuidong Primary School for their participation on the study.